Cropi-Canna Pure Premium Golden Grapefruit feminized seed is another marijuana variety with a strong history of great taste and quality. However, this one is potent, intense and pungent - a world renowned favourite similar to the Orange and Grapefruit original strain in the late 80s. 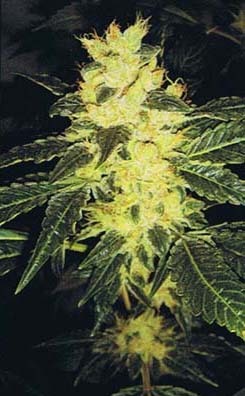 Golden Grapefruit combines delicious grapefruit taste with extra juicy bits of sugared frosted calyxes of fruit. Like any other seed from Cropi-Canna collection of the Fruits of the World Seed Range, this strain goes further than the grapefruit varieties before it, pushing new boundaries of taste, flavour and power. But with this one, if you want to, you can over do it :). Cropi-Canna feminized seed of Golden Grapefruit is new style sativa, early maturing, fast flowering (7 weeks) and maximum yielding up to 500 gr per m2 when grown indoors. When grown outdoor, the harvest month is September - October. 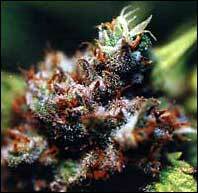 A seed of this cannabis is 65% stable and produces strong middle sized plant as high as 50 - 60 cm. Buds are covered with long reddish hairs. Growing the feminized seeds of the Golden Grapefruit is very alike any other Croppi-Canna citrus marijuana variety - it doesn't need extra care. A heavy yield is almost always guaranteed. The frosted glands produced by the plants deliver the fresh, tasty, fruit flavoured buds of ever so moreish delight and pleasure!